This statistic shows the results of a survey from 2017 on the impact of terrorism on the travel plans of Norwegians. 47.6 percent of the respondents stated that terrorism does indeed affect their travel plans. 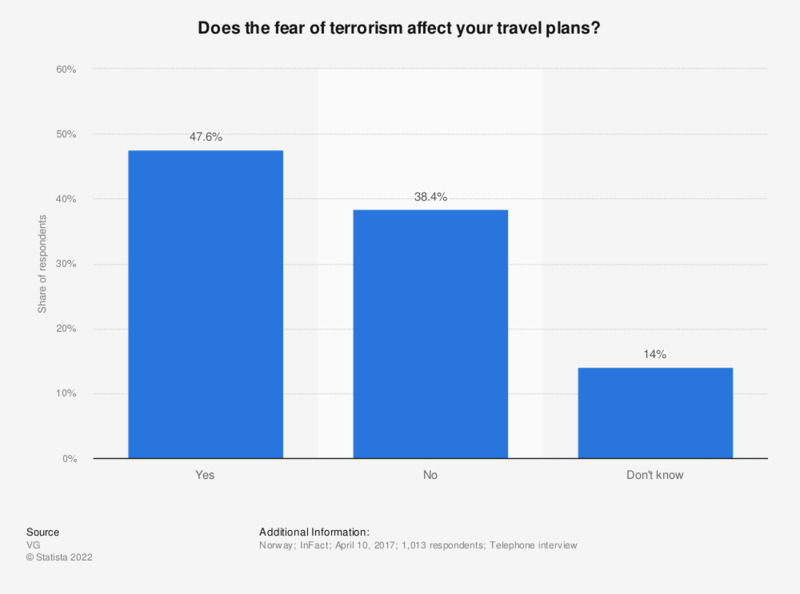 For 38.3 percent, travel planning is clearly not influenced by terrorism. Still, 14 percent are uncertain and stated to not know whether it does influence their travel plans or not. Terrorism does in fact affect the travel habits of Norwegians stronger than the general feeling of safety in the country. According to a study on the influence of the terror attack in the Swedish capital Stockholm on April 7, 2017 on the fear of terrorism in Norway, nearly 45 percent stated to not be more afraid because of that act of terror in their neighboring country. Still, about 42 percent of the responding Norwegians became more carefully and are since then more afraid of such attacks in their home country.